Now that the dust has settled I'd like to write the story of how some of the host lodge patches became among the toughest pieces for Arrowmen attending the 2014 Dixie Fellowship at Camp Coker to attain. Similar to other lodges Santee 116 issued a host service flap for the event. The deal here was that brothers on staff could earn between 1-5 depending on how many Dixie work days they attended prior to the event. None of these were sold before the actual Dixie. So when you showed up on Friday to work and made your way to the lodge store you were allowed to get the ones you were due. Some folks only got 1 (like me!) and others got as many as 5. Like most lodges the adult worker bees don't tend to be patch traders. So there not many of these floating around. However, this service flap was not the hardest host item to get at the Dixie. That title squarely belongs to the Dixie Set-up patch. 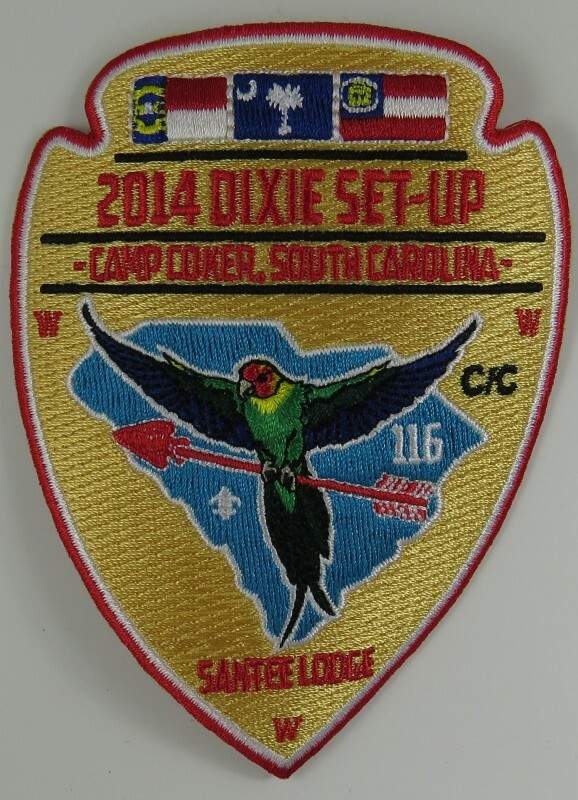 Two weeks before the Dixie (because of Easter) the host lodge held it's Dixie Set-up weekend at Camp Coker. The patch was not sold at the event. There was also never a preorder form that would allow folks to get an extra. So similar to the service flap the first time anybody got one was when they showed up to the lodge store during check in the Friday of Dixie. However, the manager of the store only let folks get one if they attended the Set-up. Nobody got to purchase an extra. So at the Dixie you had basically a 1-person patch that not everybody on staff had even received. This is why I'll say this was the toughest patch to get at the Dixie. The lodge held a regular work day the first Saturday in June. Though it was not announced the lodge advisers decided that folks attending would be given another service flap and work day patch. When the next regularly scheduled lodge event took place (OA Week & Summer Fellowship in July) neither of these patches were available for sale even though it is known that there are still some in the inventory. I don't like to use eBay results right after an event to claim the value of a patch. However, to prove my point that these patches were very hot right after Dixie I've got an auction result for you here.